A race-spec Lexus LFA, driven by car nut and Toyota CEO Akio Toyoda, provided a stomach-churning, back-wrenching, teeth-clenching run around Fuji Speedway. YAMA, Japan -- Only a couple of clues hint at the identity of the helmeted driver strapped in next to me behind the wheel of the red, black and white No. 50 race-spec Lexus LFA. There are the telltale rectangular metal-framed glasses peeping out of the visor slit. And there's the name stitched in italics on his race suit's waist strap: "MORIZO" -- the trackside nom de guerre of Akio Toyoda, president of the automaker founded by his grandfather. And as we pull out of pit row at Fuji Speedway, the speed-demon CEO seems hell-bent on proving beyond a doubt that this Toyota product fully embodies his new "fun-to- drive" mantra. While the company's Corollas and Camrys might not meet everyone's idea of driving excitement, Toyoda's mastery of the 552-hp, V-10 LFA and Fuji's tortuous Formula One circuit proves that the man at the helm unequivocally knows what fun-to-drive means. It's no secret Toyoda is a car nut. But talk is one thing. Seeing -- and feeling -- is believing. As we cruise through the pits, Toyoda makes chit-chat about the track's most notorious turns -- curves 10 through 15. But as soon as we clear the grandstand, he punches it -- pinning my shoulders to the Recaro race seatback and throwing my stomach into my throat. Toyoda drives like he means it: eyes glued to the road, both race gloves firmly wrapped around the wheel, fingers furiously flipping the paddle shifters as we drift around the curves. His foot dances back and forth between the brake and gas pedal with frenetic energy. As he winds through the tough backstretch, I shout something about whether these are the challenging curves he likes best. All I can hear is a wah-wah-wah voice muffled by the helmet and roar of the engine. Then we turn into the straightaway, and Toyoda guns it again. We fly through the 1,500-meter homestretch toward hairpin Curve 1. I watch the speedometer climb: 175 kph, 200, 225, 230, 240 ... . The instant we hit 251 kph -- that's 156 mph for you American readers -- Toyoda slams on the brakes and sends us tumbling to 150 kph in a heartbeat. We grind through the turn with our safety harnesses straining. 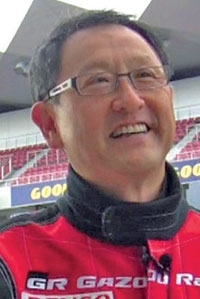 When we finally finish the stomach-churning, back-wrenching, teeth-clenching run around the track, the Toyota CEO is all smiles, like a kid coming out of Disneyland. In fact, mine is just one of several ride-alongs. Toyoda spends the whole afternoon doing laps with Japanese Lexus dealers and VIPs and seems more energized from the workout. The stiff, pin-striped persona Toyoda often conveys at press events melts away to show a man in love with the cars his company creates. He even starts speaking English to me -- a first in my three years of covering the man. And Toyoda's command is miles better than he let on last year when called to testify before Congress about his company's recalls. Afterward, Toyoda eschews the notion that a car needs 10 cylinders to be fun. "A fun-to-drive vehicle does not necessarily look like a fancy sports car," he says. "Even a three-row, one-box type of vehicle and a sedan type of vehicle people can have fun to drive." I recall the recent Toyota-produced YouTube video that went viral glamorizing Toyoda as the "race car driver and president" behind the wheel of an 850-hp Camry-based NASCAR racer. Is he cultivating that street cred as a bona fide car guy to help fire sales? "I am unique. But my role and my mission is to produce better vehicles," Toyoda replies. "If I'm rewarded with a smile, that's the best reward to me."